Humans and dogs enjoy a special relationship, both social and professional. For the latter, there are many examples with which we are all familiar: SWAT teams use dogs to help clear a room, soldiers use dogs to detect IEDs, isolated facilities use dogs to guard against perimeter breaches, customs agencies use dogs to sniff out drugs. In each of these cases, the dog is carefully vetted and highly trained. They may be working in difficult and stressful conditions – for example, in the pitch dark or under fire and they may need have skills that go counter to nature, like the ability to remain completely silent. This high level of training while extremely useful can also be very expensive. There’s another class of working canine we see in hospitals, at disaster sites and in classrooms: the therapy dog. These dogs require far less training. They don’t need to attack or defend or detect. They are vetted for socialization skills, personality and behavior. We just need them to hang out with us. But there is another role K-9s can play that lands midway on the range between therapy and SWAT team: a low level Security Dog. Not trained to detect, protect or attack but rather to complement a straight security function. After all, the mere presence of a dog has a deterrence effect. An adversary views a dog as an unknown whose actions they cannot predict. To plan an attack or event, a criminal can study the coverage of CCTV cameras or the kinds of technology in place. But a dog doesn’t come with Specifications. Even if this kind of Security Dog is clearly not an attack dog, how the dog would react in a given situation can’t be predicted and mostly isn’t worth the risk to a would-be adversary. We know that a burglar given a range of homes to attack would often rather skip the one that they know to have a dog. But at this point in time, we just don’t see the use of dogs in this kind of professional security function. Yet at so many of the security workshops and seminars we conduct, when attendees are asked what they’d like to add to their security system the answer more often than not is K-9s. 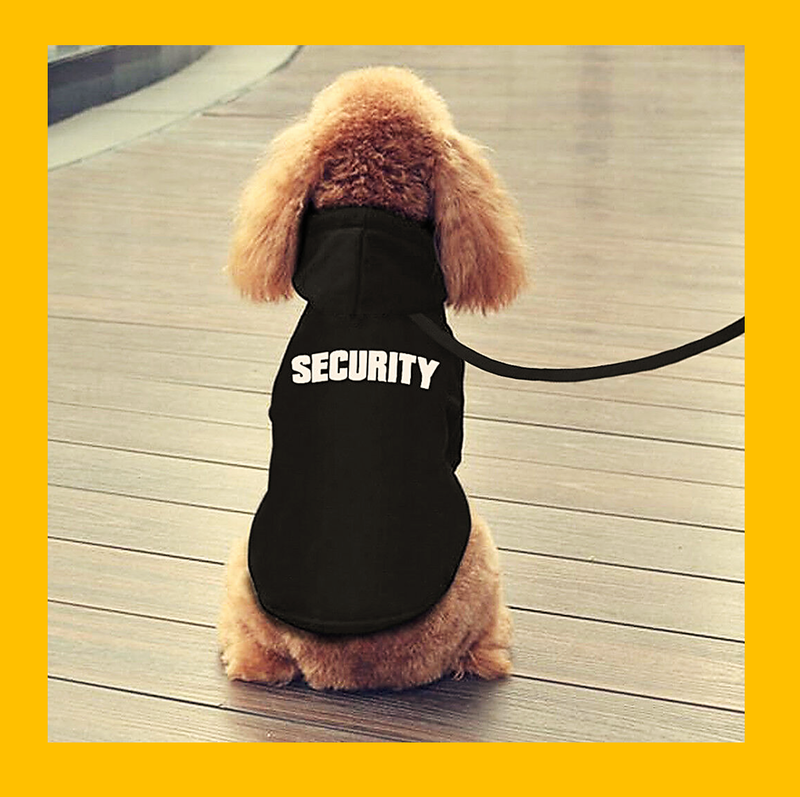 Perhaps security managers perceive K-9s as expensive. And for a certain level of dog, that is absolutely true. But for the kind of role a Security Dog as described here would play, it can be cost effective. With simply vetting, and basic training of dog and officer, I’m sure even my pup Nero could do the job. The adversary doesn’t know that Nero hasn’t spent 24 months at an elite school. And Nero’s amazing sense of smell and hearing, coupled with his fabulous personality and willingness to help are no less for not having graduated with a fancy diploma. A dog can help with officer safety, especially if the security officer is armed. Stealing an officer’s firearm with a dog at hand is just harder. Responding to an alarm with a dog in tow is preferable, too. Last but certainly not least is the public relations function that dogs fulfill. Dogs simply make people feel good. Dogs have the ability to draw attention and quickly shift a mood in a positive way. The good guys love dogs and the bad guys would prefer to avoid them. What a perfect combination. Physical security companies should consider K-9 programs that cater to the clients who don’t need a high level K-9 but could definitely benefit from a Security Dog. I worked with a small airport that used this concept most effectively. The Sheriff Deputy on duty (as mandated by TSA) had a German Shepard he obtained from a local shelter. The dog wasn’t trained to do anything other than sit, laydown, stay, heel and come. Yet when that specific deputy and dog were on duty they routinely found more drugs, and drug paraphernalia in the amnesty bin and trash cans. Many a time, you would see a passenger enter the terminal, see the dog, and immediately go outside to the trash can or their vehicle. The only issue I see with using non-specialized dogs as a deterrent is the overwhelming and vehement opposition the K9 Security Mafia will raise. For example, the K9 handlers in TSA oppose the use of Springer Spaniels, even though the breed is used extensively and very successfully for decades in Europe and Australia as bomb sniffing dogs. All this does is raise the prices paid for other breeds on their select and limited list, resulting in increased costs to the American taxpayer with limited additional security benefits. As is often the case when dealing with entrenched bureaucratic security interests the best is the enemy of good enough, especially when the security-industrial complex can make more money off the alleged best solutions. Jack – thanks for your insights!